The last 12 months have been a both a gradual buildup and a flurry of activity for the Nashville-based Judah & the Lion. The band had self-released its sophomore outing, Folk Hop N’ Roll, the previous March, but it wasn’t until late summer, after a new mix of lead single “Take It All Back” came out, before everything began to change. Slowly but surely the track caught on at radio and by the end of the year was a bona fide hit. In early January it topped Billboard’s Alternative chart, holding pole position for four weeks. The song’s success proved a catalyst for the live setting as well. It would land the group the coveted opening slot on Twenty One Pilots “Emotional Roadshow” mega tour this winter and a spot on one of the biggest rock tours of the summer alongside alt-rock veterans Incubus and Jimmy Eat World. Behind the Setlist talked with banjoist Nate Zuercher about the exciting year ahead, duplicating their high energy shows in the studio, new music, the rise of the banjo and why they won’t be slowing down any time soon. This interview has been edited for length and clarity. How’s the Twenty One Pilots tour going? That must be a pretty sweet experience for you guys. Dude, it’s been awesome. We’re over two-thirds of the way through. All the shows have been wild. Their fans seem to really take a liking to us. They’re really sweet. We’re making good friends with the crew and the band. It’s awesome. You’re a really cool match, being that you both like to play around with genres and bend and twist different musical styles. You’re doing that fun medley onstage together as well. Oh, yeah. It’s been good. You had a big announcement last week about the summer tour you landed with Incubus and Jimmy Eat World, who are two of my favorites. That’s got to be fun to look forward to. Yeah, dude. Incubus was actually my band growing up. They were my first concert. I could play more than half their songs on guitar. I’ve been really influenced by them, so I’m stoked to meet them. Then we’re all huge Jimmy Eat World fans. This year is nuts. I can’t believe all the things that are lining up. The first time I heard about Judah & the Lion was in 2015 when you opened for Mat Kearney on his tour at the beginning of that year. I remember you joined him onstage for a bluegrass cover of “Uptown Funk,” which was really fun. Was that the you felt Judah & the Lion start to build and take off? Yeah, I’d say so. That was about six months after our first record came out. We got to go to Europe a couple times, go on tour with Mat, open for Ben Rector as well. It seemed like it’s been gradual, but also a really swift process with getting more and more involved in this, being full-time now and really going after it. It’s been great. Mat treated us really well. On this current tour, and that tour as well, you always do a lot of fun covers live. That seems to be a key element of the band. What is it about doing covers that you love doing so much and putting your own unique twist on some of these songs? It gives us the opportunity to shake things up a bit. If you listen to our records or have been following us, as a listener you might kind of know what to expect, at least a little bit, coming to one of our shows. We really enjoy when we’re creating our setlist in rehearsal before the tour starts trying some different things. We’re influenced by so many different things individually, so it’s cool to be able to throw in a hip-hop song, or really anything. It also gives us an opportunity to fuse together a little bit more of our set, especially with our new record Folk Hop N’ Roll, which is already something that is kind of out there. It gives us a chance to throw in something like “Booty Wurk,” that no one would expect but makes sense in the midst of what we’re doing in trying to incorporate more dancing and getting the crowd involved. Things like this surprise people and make people smile. We find covers are a really good opportunity to do that, on top of what we’ve already written ourselves. You also released your new single last week, “Suit and Jacket,” which you’ve been opening with on tour this year. What’s the story behind that song? Judah wrote the words about that kind of as a letter to himself. He had a new nephew that was born this last year, and he also lost a dear friend of his in his grandpa last year. So it was a time for him to really assess and figure out what does this life mean. What is important? How do we chase after the things that matter, rather than getting stuck in a place of fear? Hopefully it’s not too heavy, but a take on appreciating where we are and going after our dreams in the midst of a world that tells you to settle and be careful. We can still enjoy taking risks and pursuing where our hearts take us. So hopefully people get inspired by that. Was that just a one-off single or do you anticipate releasing more new music this year? We actually have three new songs that we’re coming out with as well here in the next month. We recorded four songs the first week of January, so “Suit and Jacket” was one of those. They’ll be on a deluxe version of Folk Hop N’ Roll coming out in March. Seeing “Take It All Back” catch on the way it has, you mentioned things being a gradual buildup and then there’s this huge jump, where things are slowly building and then next thing you know it’s four weeks at No. 1. What’s it been like to see the response to that song and see how big it’s gotten? It’s been a trip. For us, it’s definitely been a gradual process. That song, when we wrote it a couple years ago, it almost felt like it was ahead of its time. We wrote it right after we released Kids These Days. Obviously it didn’t get released until the Folk Hop N’ Roll record, but we started playing it live at every show. The response we would get from the crowd was next level compared to the rest of our set. It was our favorite song to play. There was this energy behind it we didn’t feel from anything else. Playing the shows and growing in that was a steady process, but when we finally were able to release that song last year on the record, you could just tell people were getting more and more attached. Then when it started on radio this past summer, it’s been so cool to see the response. It’s absurd that it’s done so well. We’re so stoked and honored. It feels like now that we’ve had more and more people be able to hear it through radio, people are coming alongside us more with our vision for what we want to do. Whereas when the record came out a year ago, it was like, “Folk Hop N’ Roll? What is that? Why are they doing that? I don’t really get it.” Now, a year later, it really feels like we’re more established and have more of a bond with our fans that people give us a chance. That song has been the big catalyst to get us to where we are. Where did the idea of doing the 2.0 mix come from? We decided that we wanted it to be the song we take to radio, so one of the simple reasons was we needed to make it shorter. Also, since we had been playing it for so long, we had built up these new ideas that we wanted to try. The guy that co-produced our last record, we wanted to give him a shot to remix it just for fun to see how it would turn out. So it was a new creative exploration on top of what we had already done. We needed it to be a little bit shorter to fit within the radio timeframe and it just ended up working out really well. He gave that edit to us, we showed it to our team, and it breathed a new fire under all of us. We got really stoked on it and decided to go with that. Throughout this process, have you been able to stay independent or have you partnered with labels and outside people? I think technically we’re still an independent band, but we have an incredible team onboard with us. There’s lots of different folks involved, but we don’t have a specific label necessarily. We’re independent in the sense that if you’re not independent then you have a label. It’s more that we have the freedom to write the music that we want to and do all that. But we absolutely do have a team of folks who support and help us out. Where did the term Folk Hop N’ Roll come from and how did you come up with that description? Even though, as you were saying, it took some people by surprise last year, it’s such a fitting description for what you do. Even though I’m playing a banjo and Brian’s on mandolin, we started with more of a folk background as far as our performance together. We all grew up listening to different stuff and playing different things. We’re all guitar players. That was our base instrument. Brian also plays piano, but I was a punk rock, metal kid. I also did jazz band in school and both my parents are classical musicians. Brian likes Billy Joel, Ben Folds, Frank Sinatra, piano-based music. Judah is into singer-songwriters, classic rock and hip-hop. We have influences everywhere between us. When we started out, it wasn’t like we have these folk instruments. We need to make folk music. We need to look a certain way and write a certain way and all this. As we’ve progressed and written more and more together, we’ve incorporated all these different things we enjoy listening to and playing. It made more sense, even though the record turned out a little scattered. It’s a fairer representation of who we are and what we like. When we were writing the record and recording it, it felt like we could keep it all in one vein, but that didn’t feel like doing the songs justice. It’s a really honest look at who we are and what we like to listen to and write. Hopefully that comes across well. Another thing you wanted to do on these newer songs is capture the live dynamics in the studio. Has it been a challenge to capture that same energy? I think we’re getting better and better at it. With Folk Hop N’ Roll, it was definitely the goal to emulate our live energy on the record. I think we did that in a lot of ways, but in particular these new four songs that we wrote will hopefully shine through more. It’s been really awesome playing a couple of them on this tour we’re on now. A lot of my favorite bands growing up, their live performance was leaps and bounds better than their records. It almost seemed like they just put out a record because they had to, and then they focused all their energy on the live show. So I believe it’s better to have a better live show than your records, but we absolutely strive to make the records just as good. Having the opportunity to add these new songs onto what we already did with Folk Hop N’ Roll was a really cool opportunity to show our growth from this past year but still keep it all together. I hope that translates well. It’s cool to get the opportunity to rehearse and try new things in our rehearsal space. So I remember when I was growing up, the banjo was not exactly the coolest instrument around. There weren’t a ton of popular bands that incorporated the instrument. You mentioned growing up, listening to punk and metal. How did you get onto this banjo route and pick up that instrument? In high school I started trying to get into acoustic-based music a little more, partially because my dad got sick of listening to loud music in the house all the time. So he tried to help me figure out if there was other stuff I would be interested in. Through digging around a little bit, I got introduced to Nickel Creek and the John Butler Trio. With John Butler, he’s playing an acoustic guitar often through an amp, so he’s incorporating more rock sounds into this folk-rock fusion. He also plays banjo a little bit, so I got really into him. He was shredding on the guitar, so it was this cool fusion of what I like. I got really inspired by this folk-based world. Then as I graduated from high school, I got a banjo as a gift. It was one of those things where maybe you’ll like this. I know you enjoy trying new things. I didn’t have any expectations that I would actually enjoy it. I got to college in Nashville and started messing around quite a bit on it. It turns out bluegrass and metal have a lot in common with the way you think about playing them. They’re both very fast a lot of the time, rhythmic and melodic. For whatever reason, my mind really identifies with all those things. It was a new transformation of stuff I already loved in a much more friendly, mass appealing sound, at least as far as being easier to listen to and more people are willing to. But for me, it’s the same headspace. I was presented with this new challenge with a new interest to learn and a new family of instruments to play along with. So I love it. It’s very fun and exciting and fast paced. You have to figure out your place in that and doing it with these guys has been really, really cool. Do you still play a lot of guitar these days? I do. It’s a little harder on the road, just because I already have so much gear I have to bring along to make my rig happen with the banjo, but when I’m back home I try and write more on guitar. I crank up those songs and rock out with it. Banjo I would say is my primary now, but I try and play guitar as much as possible. What has it been like as a banjo player to see that instrument rise to a prominent level in the mainstream? Mumford & Sons were probably the big one that brought it into the light, but others like Avett Brothers, and like you were saying Nickel Creek and John Butler, were helping it along before then. So what’s it like seeing it at the level its at now? It’s really cool, and to be a part of that vision is a real treat. I graduated high school, got that banjo, and then a month later I heard “The Cave” by Mumford for the first time. That was the moment where I went, “OK, I could do that.” Banjo is such a technical instrument it’s like, how the heck are they doing that? That sounds insane. Super cool, but I will never be able to do that. The way Winston played with Mumford, it wasn’t that it wasn’t technical, but I could understand what was going on. Like, I want to do that. So to be inspired by him, and now I’ve heard so many stories of people being inspired by my playing, it’s hard to top that. I’m thankful this is all picking up and banjo is becoming a more mainstream thing because it’s something I love so much. It’s been a really cool experience getting to learn and sharing that with people. I love being at least a small part of that movement and how something that I love so much is being loved by others more and more. It’s an honor, for sure. “You make art for yourself and you want people to like it. 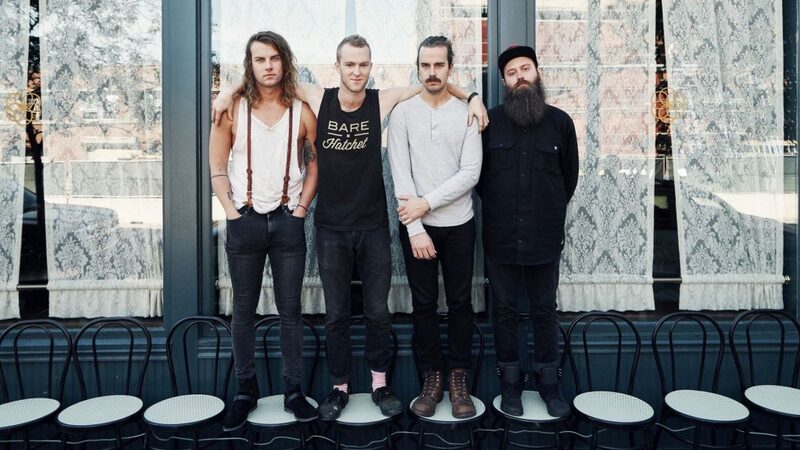 Judah & the Lion originally started out as this little worship band. What has this jump and transformation you’ve gone through over these last couple years been like? Judah had written our first EP before he met me and I came along. He invited me to a jam session to hear what the songs would sound like in the folk realm. So when Brian came along too, we were going with what had already been written. We all played together at church at different points, so it felt really natural for where we were at. But when we started to write together, it didn’t feel like it was the direction we wanted to go as a whole. It was a big process of trial and error, figuring out if this could work well together. It felt more natural to not limit ourselves within the Christian music world. We wanted to write what was honest to us, and some of the songs are definitely about our faith as we’ve progressed through the last couple records. But we also wanted to write about our relationships and addictions and every struggle that anyone goes through. We wanted to capture a more honest view of the lives we live, and what other people go through as well. We obviously changed musically, with the sound, but also we weren’t writing just worship songs. That’s absolutely a part of who we are, and we want to be real with that, but it wouldn’t be a fair representation. Everyone has their good and bad days, and we wanted to be able to tell our story of that. With the tours you have this year and the success “Take It All Back” has experienced, you have all this momentum and are a quote-unquote “buzz band” right now. When you look ahead to the future and what’s coming up, what’s on your mind? How exciting is it to think about that next step? It seems every week right now, or even more often than that, we’re getting some new phone call or email about “you could do this” or “this is happening.” It’s a really fun season. Particularly since that song got on radio, things have picked up a lot faster. There’s more and more people getting involved and excited. It’s so cool. You make art for yourself and you want people to like it. You want to represent yourself well and get better at your craft and who you are. When people are also excited about that, it’s hard to beat. I’m super thankful that we’re getting all this buzz and all these opportunities coming up. This year is going to be a lot and we’re not slowing down any at all. We’re trying to stay healthy and happy amidst all the chaos so we can best appreciate all these exciting things that are happening. Here we go, man. It’s going to be a heck of a year! Popular Science: What Makes a Hit?